It was a beautiful Sunday with partly-cloudy skies and temperatures in the 60s so we set off to explore a place new to us: Liberty Park, a Summit County MetroPark in Twinsburg. 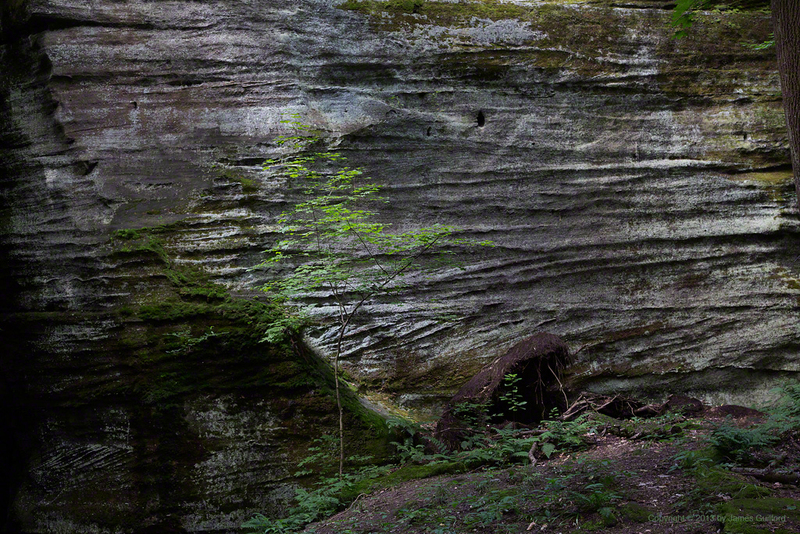 Our favorite area was the Twinsburg Ledges and its woodland trail. The gravel path took us deep into the dark woods amongst tall trees, low ferns, and moss-covered rocks. There were many beautiful sights along the way but a standout was a cave, of sorts. 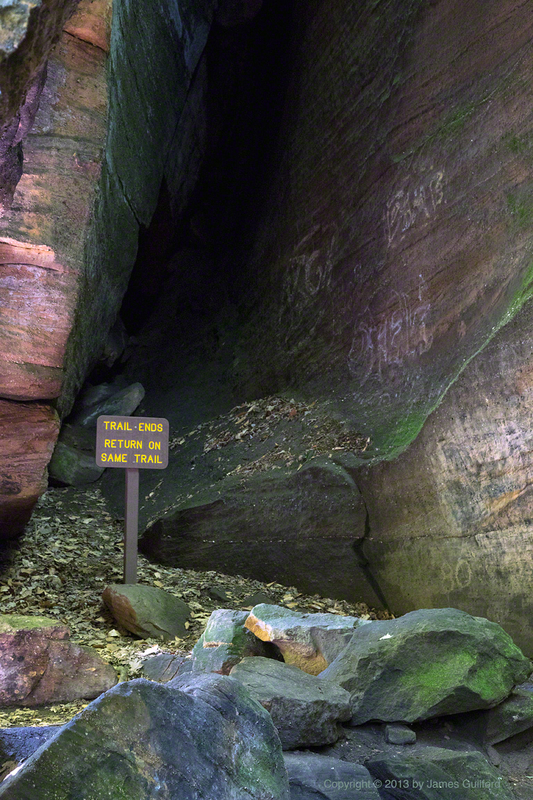 A short spur trail leads visitors to Glacier Cave which is not so much a cave as a deep opening in a rock wall. 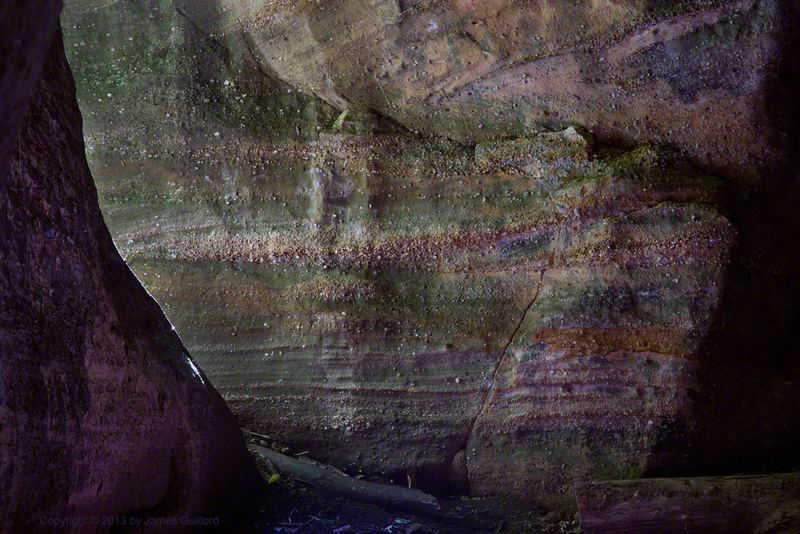 Cave or not, the exposed rock face was fascinating: strong striations run across the conglomerate rock, tree-filtered sunlight accentuating the textures. Inside the crevasse and looking up, one can see soft light penetrating the open space, caressing moss-covered, sculpted rock. At the bottom of the shaft was a beautiful opening where light, tinted green by tree leaves, bounced off red rocks, illuminating an already-colorful wall. We will return, hopefully soon, to Liberty Park. Armed with tripods and plenty of mosquito repellant, we will be better prepared to spend time and make even better images. What an interesting place – I look forward to the ‘better images” 🙂 The bottom shot and your caption gave me a laugh. Yes, I’m hoping to get back there soon. I’m a little skittish due to the ferocity of the mosquitoes but, with sufficient repellant spray, maybe I’ll be okay! I got a chuckle over the scene and sign myself, when I encountered it.